According to the National Park Service, Capital Bikeshare stations would destroy what makes the National Mall an American institution. Do you agree? Photo by Mr. T in DC. 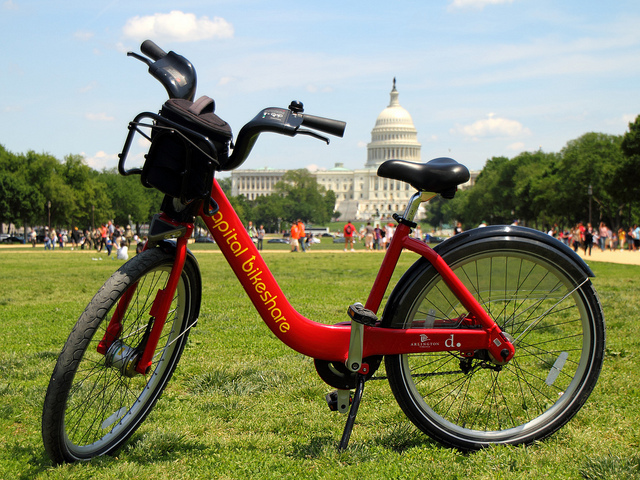 An article in this month’s Spokes magazine, calls to question a recent debate on installing Capital Bikeshare stations on the capital’s National Mall. Currently, the National Park Service prohibits Capital Bikeshare stations from being placed on the Mall due to federal laws protecting the nature of national parks, the article explains. Bill Line, a spokesman for the National Park Service explains that the National Mall operates under the regulations of the National Environmental Policy Act, enforced by the Environmental Protection Agency, and the National Historic Preservation Act, which requires federal agencies to preserve historical federal property as close to its original state as possible. For a Bikeshare station to be added anywhere near the Mall, the EPA would have to conduct an environmental assessment and review whether such an installation would be harmful to the park’s preservation. And even so, the National Historic Preservation Act may still prevent the bike-share station from installation. “Although a Bikeshare station would be convenient, it would destroy the nature of what makes the national Mall an American institution in the first place,” Bill Line says in the article.“The National Park Service is an organization that strongly encourages (the) use of mass transit, but Capital Bikeshare wants to place a structure on the National Mall, which (the park service) does not allow under current regulations,” Line said. According to the article, the one vendor that is allowed to put structures on the Mall is Guest Services Inc., which provides food and beverages for the national parks and the Smithsonian museums in the greater Washington area. The only way commercial services will ever be allowed within the Mall’s boundaries is if they are deemed “necessary and appropriate.” Even then, the aforementioned service will be located as far away from the park as possible as to not interfere with the park’s natural state. Currently, there are Capital Bikeshare stations near the Mall. The nearest one is at 10th Street and Constitution Avenue NW with 39 bikes; 19th Street and Constitution Avenue NW, with 23 bikes; and 12th Street and Independence Avenue, SW with 39 bikes, the article explains. Do you think Capital Bikeshare stations threaten the history and authenticity of the National Mall? How would you deal with this dilemma? Tags: bicycle infrastructure, bicycle rental, bike parking, bike-sharing, Capital Bikeshare, cycling, North America, United States, Washington, D.C.